Garlic scapes, the flower spike of the garlic plant, are an eagerly awaited annual treat on the farm. We cut the flower off so that the garlic plant will put more energy into the bulb, resulting in a larger head of garlic. Each garlic plant will produce only one spike, so it is a singular harvest. But what a beautiful and delicious harvest. 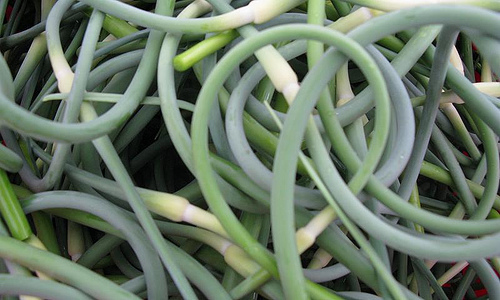 We chop scapes up and use them in place of garlic in any dish. But our favorite way is below. 1. Cut the garlic scapes into inch-long pieces (use the entire green stem and white flower but don’t use the last couple inches on the pointy end — it gets a little tough). 2. Heat olive oil on medium heat. 3. Add scapes and sauté, stirring occasionally, until tender and quite wrinkled (almost like an overcooked green bean).